Note: I have taken down the video of Engel’s MSNBC program since the embed code doesn’t serve the video. But follow the link below to watch it on the MSNBC site. Richard Engel produced several eye-opening stories from a reporting trip to Israel. The most shocking one exposes the machinations (video and article here)behind the Trump administration’s attempts to sabotage the Iran nuclear deal, which the president reneged on a few weeks ago. Engel recruited a source from within Black Cube to go on camera to reveal virtually all the remaining secrets about the firm’s hiring to dig up dirt on two key Obama administration operatives who played major roles in negotiating the JCPOA (the nuclear deal). Unlike previous reporting on this story, Engel presents the material from the dossiers compiled on one of the subjects, Colin Kahn, to him on camera. He actually displays a good deal of the material on screen with personal information obscured from view. Equally interesting, is his interview with Trita Parsi, the director of the leading Iranian-American political organization, NIAC. In it, he plays Parsi the recording of the conversation a Black Cube operative conducted with him, in which the former attempts to ferret out damaging information about Kahl and Ben Rhodes, the second Obama official. The reporter offers just enough of the conversation to convey the sleazy, and amateurish nature of the attempt to damage the reputation of all three men. Though I am not in their league, I’ve had enough people attempt to ‘play’ me that I like to think I can sniff out a rotten apple most of the time. This conversation, had the caller been approaching me, would’ve raised red flags almost from the get-go. 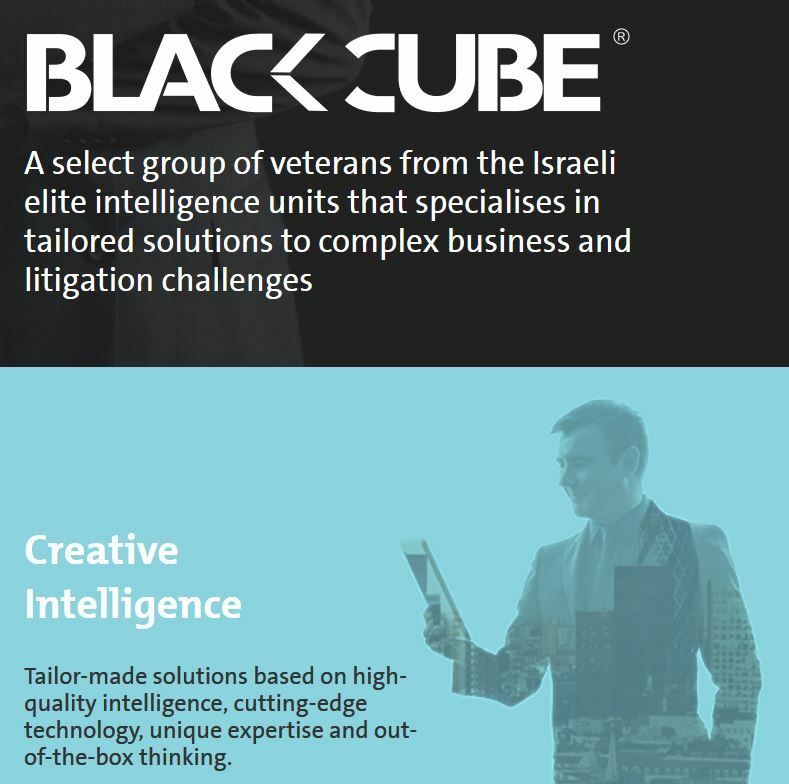 This makes you realize that though Unit 8200 and other Israeli intelligence agencies from which Black Cube recruits its agents may have outsized reputations, they’re often just plain bad at what they do. Their machinations are transparent, their methods primitive. So much for the Israeli intelligence juggernaut. Returning to Parsi, he reminds us in his Twitter feed that NIAC’s offices were burglarized amidst all this activity, during which two computers belonging to senior staff were stolen. The theft was so professional that no fingerprints were found, the power to the building’s floor where NIAC was located was turned off, and CCTV cameras were deactivated. DC Police never found any evidence or leads to solve the crime. All roads lead to Black Cube on this one–though no one can finger it definitively…yet. This is the sort of black bag job that Israeli intelligence agents have been doing for decades. Black Cube would have operatives who could do this in a heartbeat. Another aspect of this story brings more recent events concerning Trump’s dumping of the deal into greater focus: clearly, in this shabby attempt to sabotage the deal through smearing those who were key figures in shepherding it to completion, there lay a fear that the deal was popular enough that it would require a nasty scandal to tarnish it before Trump could back out of it. Black Cube failed to deliver the goods. That meant Trump needed a Plan B. That turned out to be Netanyahu’s cheesy dog-and-pony-show at the Kirya, when he drew back the curtain like an amateur magician on what purported to be a treasure trove of Iranian nuclear secrets. But on closer inspection, Bibi’s bonanza was nothing of the kind. All the information which he claimed was hitherto unknown to the west about Iran’s perfidy in violating the nuclear deal was old and already available to western intelligence agencies. My friend, Prof. Muhammad Sahimi believes the entire “Iran Lied” presentation was fake. He doesn’t believe the Mossad discovered anything inside Iran, let alone secretly conveyed it to Israel. But even if we don’t go that far, whatever is in that archive does not support any of the claims Netanyahu made about it. It’s clear to me that this show-and-tell was meant to substitute for the Black Cube smear campaign that failed. Trump and Netanyahu organized a concerted campaign to prepare world opinion for what they hoped would be Trump’s dramatic act of destruction of the P5+1 agreement. But as it was, it was all a come-down. Everyone knew what Trump planned before he announced it. And Netanyahu’s gambit landed like a lead balloon. American public opinion supported the deal while we were in it and continues to support it after we abandoned it. This is all of a piece with Trump’s absolute inability to execute any of his major policy initiatives, especially those involving foreign policy. Finally, all this raises a question about what role if any it might play in the special counsel’s investigation. I doubt any American president has ever hired a private foreign intelligence agency to spy on and destroy the reputations of officials in a preceding administration. In America, we have a pretty ironclad aversion to permitting foreign intrusion in our domestic affairs. I’m not a legal expert and can’t say what, if any laws, may’ve been broken. But if none were, it means federal law is woefully inadequate to address this outrageous breach of all norms of presidential conduct.